Rental car companies and automobile racing have a long history, although the idea is a bit incongruous. After all, every rental car company's terms and conditions list racing as a prohibited use and doing so is a guaranteed entry onto the rental company's "Do Not Rent" list. Yet it's undeniable that there's value for the brand to be seen by consumer market segments with interest in automobiles, leading Hertz to announce a vehicle sponsorship in the highest tier of NASCAR competition, currently named the Monster Energy NASCAR Cup. 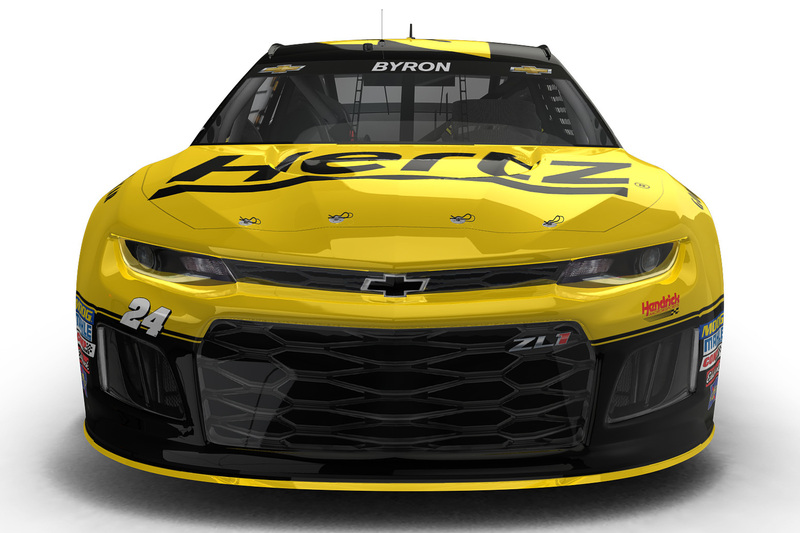 Viewers of the sport will see the familiar Hertz logo starting tonight in the Monster Energy Open, a qualifying event for the annual All-Star Race, on the #24 Hendrick Motorsports Chevrolet of William Byron. The images from Hendrick's website show a distinctive ride! Enterprise once served as the Official Rental Car Provider of NASCAR but now limits their sports sponsorship to primarily the NCAA; Hertz will be sponsoring just the #24 car in the Monster Energy NASCAR Cup series. This isn't Hertz's first foray into NASCAR or racing. The company has previously sponsored Penske Racing Fords in the second-tier Xfinity Series (especially in races when Joey Logano drove) and the company still has active sponsorships of Porsche GT Racing teams; I recently had the pleasure of encountering (but sadly not driving) one of those Porsche GT's in Atlanta. While Hertz is joining Hendrick Motorsports as a primary sponsor, that slick paint scheme won't be on the #24 for every race. Hertz will be the primary sponsor for eight total points-earning races (four in 2018, four in 2019) and this all-star weekend. 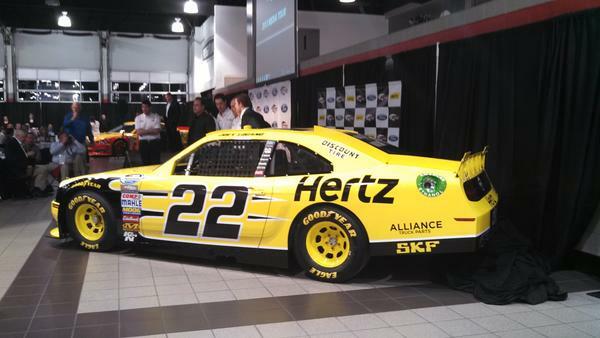 The remainder of the season, Hertz will be an associate sponsor with smaller logos. Of course, Hertz will still be visible on the vehicle, driver suit, and crew equipment. And Hertz will be mentioned with the litany of other sponsors during every driver interview. This is a perfect partnership. Hendrick Motorsports has a proven legacy of winning in an incredibly popular and iconic sport. Hertz is also an iconic brand with a 100-year history of success delivering superior service to car rental customers. At Hertz, ‘we’re here to get you there,’ whether that’s to a NASCAR event, business meeting or vacation destination. We can say that statement was a little disjointed but why is the phrase we're here to get you there in quotes? It's intended to be Hertz's next great tagline, per filings with the United States Patent and Trademark Office. While the race car might win a race or two, that slogan's not a winner in our book. We're still partial to the truly iconic "Let Hertz Put You in the Driver's Seat". We prefer good slogans, or at least slogans that rhyme! Ready to rent your next rental car for a trip to the racetrack (or anywhere else)? Request quotes via the links below and we'll send you the best available offers within minutes. Just remember to drive the speed limit and avoid using the chrome horn!